How do you make a successful TV show chatbot? When it comes to mass-market adoption, bots are still in their infancy, but their potential across industries from customer service to eCommerce and entertainment is hard to deny. Entertainment has attracted the attention of bot makers. For instance, 'Assistant'-style bots like Crypt TV provide a way to consume niche content (not that niche, it's the 5th most popular Facebook Messenger bot!). The ability to bring a fun, conversational voice to help the audience interact with entertainment content seems like a no-brainer. However, the reality has been a little different, with few success stories in TV so far. 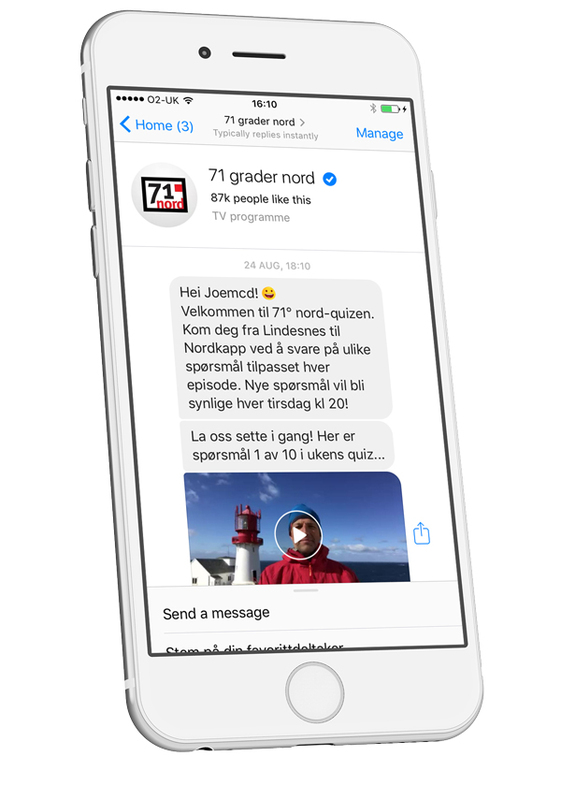 But....we think we might be onto something with our new "71°N Bot" for Norwegian broadcaster, TVNorge. We were tasked by TVNorge (part of Discovery Networks), to create a form of interaction that broke new ground, and built on the ongoing success of the format. It's a show that's been on air since 1999, officially making it the world's longest-running reality TV show! 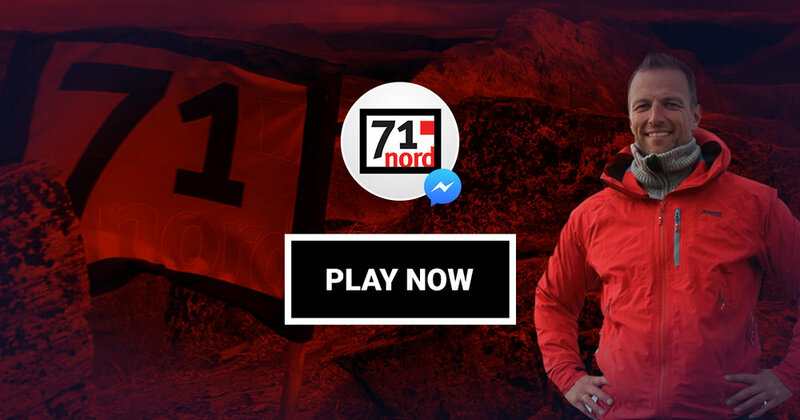 The "71°N" contestants are highly competitive, as are Norwegian TV audiences. We wanted to challenge fans weekly, testing their knowledge about the show, and about Norway as a whole. Next, we had to consider where a fan challenge could, and should, live. Our suite of interactive products includes apps, web apps and chatbots. We needed something scalable, engaging yet quick to deploy, so our chatbot product FanBot seemed a perfect solution. Apps have their place with TV, we create many of them, but in this case we all wanted to try something light and new that might pioneer a new approach as a blueprint for the future. One benefit of Facebook Messenger is that the learning curve is minimal; buttons, controls, typing, layout are familiar to most users. It's the most-used messaging app in Scandinavia, popular with all ages. Getting people going is always the hardest stage - so we wanted to create an easy-to-understand concept with a conversational game flow that would guide the user seamlessly from start to finish without instructions. But the key challenge surrounding chatbots is their high drop-off rates, so we knew we needed to include mechanisms that would keep people engaging with the bot and playing the game both during and between the weekly episodes. One component of our concept is the all-important Leaderboard, transforming what's already a shared viewing experience into a highly competitive one. As well as fans answering various quiz questions to earn points, we knew we had to devise something else to keep them hooked. How could create more separation of leaderboard points, while giving super-fans a ‘leg-up’ the leaderboard, and reward them for their dedication to the show? Luckily, we have LViS our powerful interaction platform widely used by TV companies around the world. LViS lets us rapidly create ideas such as special, limited-lifespan bonus questions and boost codes that award users extra points. To fuel anticipation, we built a feature that pushes out alerts and then rewards users who answer quickest with more points than those who take longer. A sliding scale points-weighting mechanism that keeps fans on their toes and the show front-of-mind throughout the week. The broadcaster can also send out bonus codes which give fans additional points and other rewards. These are assets that could become sponsor-owned in future shows. Stay tuned for more updates as the series continues. 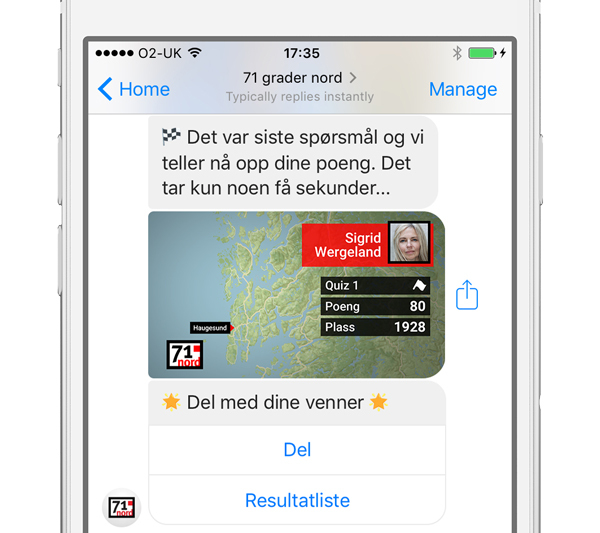 And if you fancy trying out your Norwegian language skills, give the 71°N Bot a try!